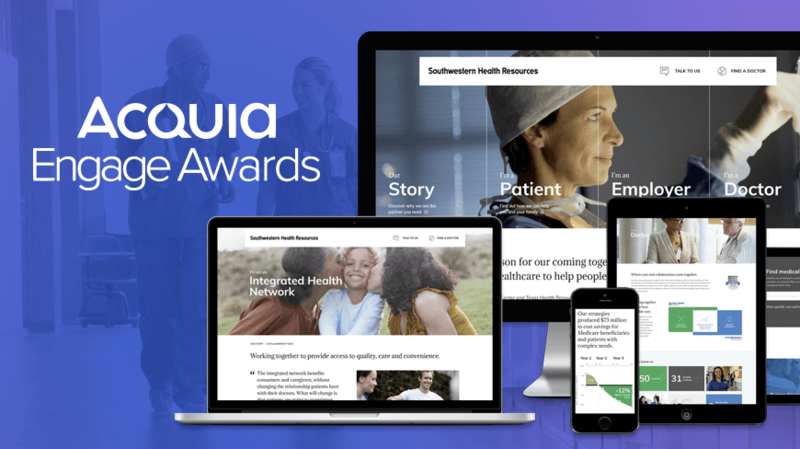 CHICAGO, IL– October 24, 2018 – Global digital agency, Isobar, today announced it was selected along with Southwestern Health Resources (SWHR) as the winner of the 2018 Acquia Engage Awards in the Lightning in a Bottle category. The Acquia Engage Awards recognize the world-class digital experiences that organizations are building with the Acquia Platform. SWHR engaged Isobar to completely revamp, redesign and implement a new digital presence for them. To do this, Isobar worked to create a simple, genuine story that allowed the brand to relate with consumers in a way that’s credible, approachable and, most importantly, human. To do this, Isobar turned to Acquia’s suite of tools: Drupal, Lightening, Lift and Content Hub. With Isobar’s design and Acquia’s platform, the site has experience incredible success, including 609% increase in organic traffic and zero security of vulnerability issues. Acquia partners and customers submitted more than 100 nominations to this year’s award program across 15 categories. Forty-five nominations that demonstrated an advanced level of visual design, functionality, integration and overall experience advanced to the finalist round, where an outside panel of experts selected the winning projects.